There are many programs available for those who might be interested in getting involved in the worship here at St Andrews. The Altar Guild invites anyone who might wish to help prepare for worship services and weddings and funerals to join them. There is also need for ushers, acolytes, lay readers, and chalice bearers. The choir would also welcome anyone who would like to become a part of its ministry. We encourage anyone who loves flowers and/or arranging them to talk with Patty Walls who leads the Flower Ministry here at St Andrews. 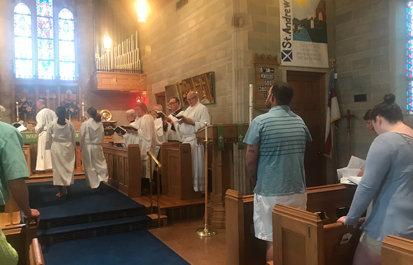 St Andrews has an active Lay Eucharistic Visitor (LEV) ministry so if you would be interested in carrying the Eucharist to our homebound parishioners please look into this service by contacting The Rev. Deacon John Gaskill. So, as you can see, there are many opportunities to serve and enjoy being a part of the worship ministry of the church. We hope you will join us in some phase of the worship program. The word acolyte means “follower” or “attendant.” An acolyte assists the priest and other ministers during the service to help make things run smoothly. 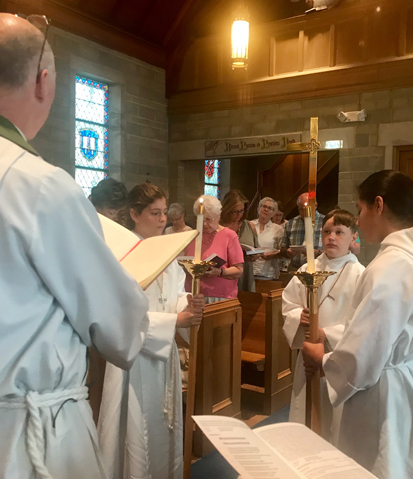 An acolyte can assist in worship by carrying a processional cross, lighting candles, holding the Gospel book, holding candles or “torches”, assisting a deacon or priest set up and clean up at the altar, handing the offering plates to ushers, and many other tasks as seen fit by the priest. Acolytes are usually youth but may be an adult. If interested in possibly participating in this ministry, please contact The Rev. Deacon John Gaskill. Ushers are the smiling faces that greet you every Sunday morning as we gather for worship. To usher is to be a leader, a guide, a helper and a doorkeeper. Ushers do more than pass out bulletins: they help with the orderly running of the service by guiding parishioners to the altar rail for Communion, counting how many parishioners attend each service, collecting the offering and helping anyone who needs assistance. This is a vital ministry, one of hospitality and supporting our worship. The Usher Coordinator is Karen Westbrook, and you may contact her if you are interested in serving. A Lay Eucharist Minister, or “Chalice Bearer,” is a person licensed by the bishop to administer the consecrated wine of the eucharist. At St. Andrew’s Eucharistic ministers usually vest in an alb. 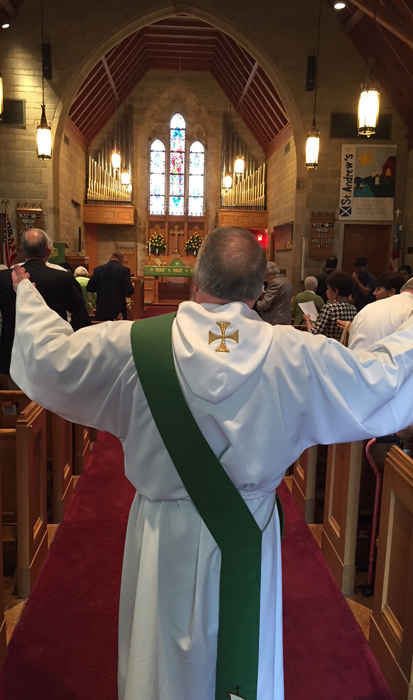 Generally, they volunteer to serve and are trained by the the Rector or our Deacon. The Eucharistic ministers at St. Andrew’s do not take their positions lightly and consider their ministry a special responsibility. Lectors are non-ordained volunteers who participate in a ministry of service to the congregation. Lectors rise out of the congregation to move to the lectern to read the lessons from the Bible during the service. A Lay Eucharistic Visitor (LEV) is a layperson authorized to take the Consecrated Elements in a timely manner following a Celebration of Holy Eucharist to members of the congregation who, by reason of illness or infirmity, were unable to be present at the Celebration. Eucharistic Visits may take place in a home, hospital, rehab center or nursing home. Eucharistic Visitors are trained and licensed. A Eucharistic Visit is both sacramental and pastoral. It is a sacramental visit because we bear the sacraments of the bread and wine on behalf of the community at large as part of our ministry. At the same time we must be prepared to act pastorally to those we visit. St Andrews has an active Lay Eucharistic Visitor (LEV) ministry, so if you would be interested in carrying the Eucharist to our homebound parishioners please look into this ministry by contacting The Rev Deacon John Gaskill. The Altar Guild prepares the altar before and after all services. Guild members care for all linens, silver, wood, and brass. The Altar Guild is made up of teams that rotate weekly on a regular basis. Anyone interested in working with this group should contact Karen Westbrook. Additionally, our Flower Ministry works with the Altar Guild, arranging the flowers we enjoy on the altar during each service. Following each service this group is also responsible for rearranging them into smaller vases and taking them to others in the community who may need a little cheer. The flower ministry is also responsible for adorning the sanctuary during the holiday seasons. We encourage anyone who loves flowers and/or arranging them to talk with Patty Walls.